I'm on honeymoon with my wonderful wife! Isn't the heart of England just beautiful? With views like this in England, who needs Scotland anyway? At least, that's what the Queen probably really thinks. For reasons of privacy no pictures of the wedding will be on my blog but here is a picture of the cake. God bless readers. Thank you to all who attended our wedding, to all who have shown us such generosity and kindness and to all who pray for us. Keep us in your prayers. Christ, love His will and abide in His love. I didn't know Elgar was a Catholic. Congratulations and may God bless you both! Sincere congratulations and best wishes to you and your wife. God bless you both. 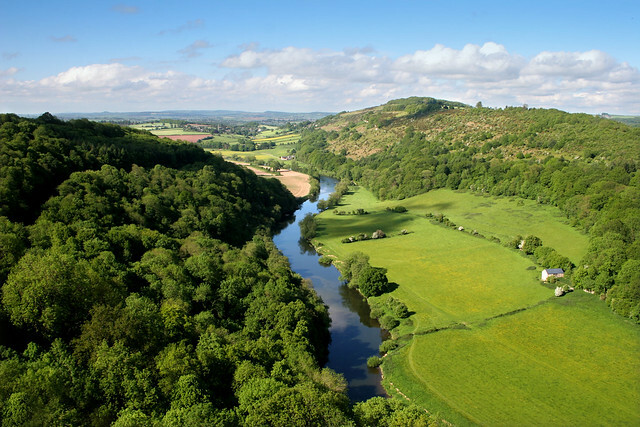 Is that the Wye valley? One of the most beautiful parts of the world. My father was born near there. Congratulations Bones! May you and your lovely wife have many, many happy years together. If you're half as happy as my husband and I you'll do well! Congratulations on your marriage Laurence. I wish you both a long, happy, healthy life together. I recognise that picture. It is just a few miles from the Benedictine Abbey at Belmont, Herefordshire. May you both have a long and happy life. Congratulations. Will keep you and your wife in my prayers. What's your wife's name? Can we see just one photograph of you both on your wedding day?? Forget my request for a photo - I missed that you said you wanted privacy. God bless. Congratulations, Bones. I am exceedingly happy for you. Many congratulations to you and Mrs. Bones. May your marriage be blessed, long and happy. Yes, Elgar was a Catholic. He also had a sister who became a nun. God's blessings on you, your wife and any children whom He may send your way! Elgar the composer of Pomp and Circumstance I presume? God bless you both, Mr. Bones and hope you are both very blessed and happy together. The cake looks delicious, too!. "Jesus, Mary and Joseph bless you and ALL your loved-ones". Congratulations and many happy years together. Congratulations and many, many blessings! This is wonderful news - May God bless you both! Congratualtions to Mr. Bones and his wonderful wife! May Our Lord bless you both abundantly! Congratulations to Mr. and Mrs. Bones! I guess when Fr. Blake wrote recently “ two of my favourite people had a splendid wedding” he was talking about you. May God bless you both abundantly! Congrats to you and your bride, and God bless you both. Warmest good wishes to you both. Very good wishes to you both and my prayers. Elgar was born in a lovely little house in the Malverns which you might see also. His Dream of Gerontius is a wonderfl meditation about Purgatory. Ah, what a view...Love England and Wales so much. Have a wonderful time. Hope the cake tastes as good as it looks. May God bless you both and enjoy a wonderful marriage! God bless you both. Ad multos laetosque annos!